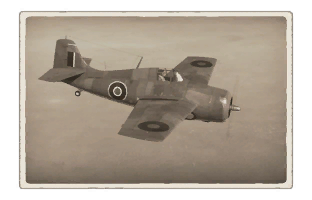 The Martlet Mk IV is a Rank II gift British naval fighter with a battle rating of 3.0 (AB/SB) and 2.7 (RB). 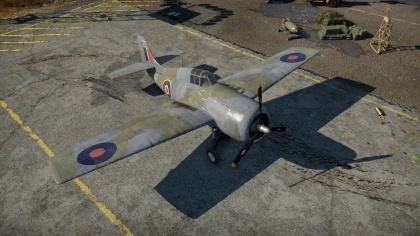 It was introduced in Update 1.79 "Project X". It is a British licensed and slightly modified version of American Grumman F4F-4 Wildcat. 826 320 ??? ~?? ~? Good dive speed and characteristic. Outran easily by most opponents. Low ammo count of only 240 rounds per gun. The Royal Navy purchased 220 F4F-4s adapted to British requirements. The main difference was the use of a Wright R-1820-40B Cyclone in a distinctly more rounded and compact cowling, with a single double-wide flap on each side of the rear and no lip intake. These machines were named Martlet Mk IV. This page was last edited on 16 February 2019, at 19:13.